Abstract: For the past several years, we have been developing new classes of high-power semiconductor optoelectronic emitters and detectors based on the slab-coupled optical waveguide (SCOW) concept. The key characteristics of the SCOW design (i.e., low index-contrast, coupled-mode filtering, low optical confinement, and low excess-optical-loss), enable waveguide devices having large (> 5 x 5 μm) symmetric fundamental-mode operation and long-length (~ 1 cm). These “macrophotonic” dimensions allow efficient coupling to optical fibers and external optical cavities, and provide reduced thermal resistance for improved heat dissipation, respectively. In this talk, we will review the SCOW operating principles and describe applications of the SCOW technology ranging from Watt-class semiconductor optical amplifiers (SOAs), to monolithic and ring-cavity mode-locked lasers, to single-frequency external cavity lasers, to high-current waveguide photodiodes. Biography: Paul W. Juodawlkis received the B.S. degree from Michigan Technological University, the M.S. degree from Purdue University, and the Ph.D. degree from the Georgia Institute of Technology, all in electrical engineering. 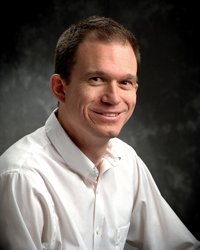 Dr. Juodawlkis is currently Assistant Group Leader of the Electro-Optic Materials and Devices Group at the MIT Lincoln Laboratory where he is leading research on semiconductor optoelectronic devices and microwave photonics. He has served as chair of the IEEE Lasers and Electro-Optics Society (LEOS) Technical Committee on Microwave Photonics (2003-2006) and as a subcommittee chair for the 2007-2008 Conference on Lasers and Electro-Optics (CLEO). He is also a member of the Optical Society of America (OSA) and the American Association for the Advancement of Science (AAAS).